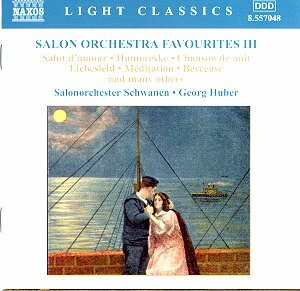 Here is a third volume of light music favourites performed with élan and affection by Georg Huber�s ten-strong Salonorchester Schwanen. It�s the sort of programme that even if you do not know all the items by name you will certainly recognise most of the melodies. Taking pride of place is the 17-minute �Potpourri� from Kálmán�s popular operetta, Die Csárdásfürstin (�The Gypsy Princess�), composed in 1915 towards the end of the grand Viennese era. One lovely tune tumbling after another, entrances the ear. Other Viennese representations in this sparkling concert include old favourites: Kreisler�s spellbinding Liebesleid and Liebesfreud unashamedly afforded the full old-fashioned sentimental treatment; the haunting �Im chamber séparée� from Heuberger�s The Opera Ball, and Oscar Strauss�s lilting Waltz Dream number. Then there is Suppé�s swaggeringly exuberant Devil�s March, Josef Stauss�s buzzing little Dragon Fly and Komzák�s amusingly evocative Storm Galop with the horses clearly anxious to get under cover, and Fuč�k�s equally amusing and cheeky military take-off, the Florentiner Marsch, its trio instantly recognisable. Moving on to France, we have Godard�s lovely �Berceuse� from his opera Jocelyn and Massenet�s ever-popular �Méditation� from Thaïs, given a ripely sentimental and dramatic reading here. A somewhat twee rendition of Dvoř�k�s Humoresque and rather continental renditions of Elgar�s Salut d�amour and the Chansons (Matin done in an unseemly rush) with odd saxophone and accordion colourings complete the programme. On the whole, an entrancing hour of salon favourites played in the unashamed old sentimental style with élan and enthusiasm.